1. Squeeze extra water from the drained, rinsed tuna. 2. 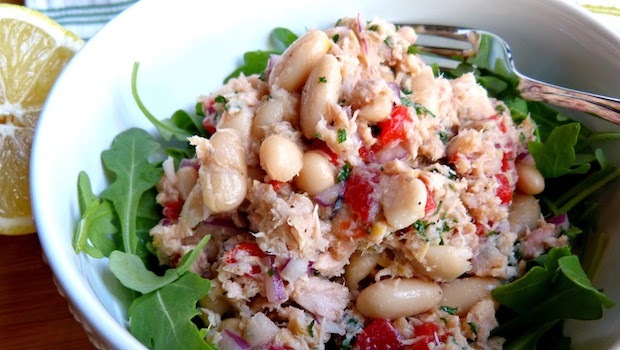 Place tuna in a medium-sized bowl and flake with a fork. 3. Add the drained, rinsed can of white beans. 4. Toss in a few tablespoons of capers or quartered Kalamata olives. 5. Add olive oil, vinegar or lemon juice, and pepper to taste. 6. Stir to mix and serve over salad greens. Optional: add some chopped walnut halves and diced jarred roasted red peppers.